A Civil War is now upon us, and you must take the field as the leader of the Union or the Confederate forces. 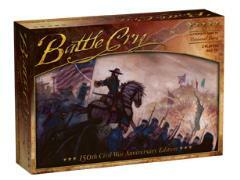 Command your generals and direct your infantry, cavalry, and artillery in 30 different scenarios that feature the terrain and troop deployment of each historical battle, from First Bull Run and Wilson's Creek to Prairie Grove and Gettysburg. History may have been written, but with Battle Cry the outcome of each battle is up to you. With your strategy and tactics, you can turn the tide to carry Old Glory or Dixie to victory. Contains 30 battle scenarios (including 13 new ones), for maximum replayability. All new art and graphics.